FALSE FLAG TO "GO HOT"? "It’s going hot." Those were the ominous opening and closing words from my source inside the Department of Homeland Security in two separate contacts we had within the last 72 hours. Readers to this website and listeners to my radio program know this source as "Rosebud," a source with access to high levels within the DHS administration. Does this means that a "False Flag" operation will definitely happen? According to Doug Hagmann of Homelandsecurityus.com his source known as "Rosebud" within the Department of Homeland Security has indicated to him that the approval to go ahead with operation has been given. It would involve a finacial component, a racial component, and would be an event such as 911, Oklahoma city etc. to galvanize the public which would make the population fear a change in leadership during the run-up to the election in the U.S. The U. S. government has become more and more intolerant of dissent -the mark of a government headed down the road to Fascism and dictatorship. A leaked U.S. Army document prepared for the Department of Defense contains shocking plans for "political activists" to be pacified by "PSYOP officers" into developing an “appreciation of U.S. policies” while detained in prison camps inside the United States. The document makes it clear that the policies apply “within U.S. territory” and involve, "DOD support to U.S. civil authorities for domestic emergencies, and for designated law enforcement and other activities," including "man-made disasters, accidents, terrorist attacks and incidents in the U.S. and its territories." The manual states, "These operations may be performed as domestic civil support operations," and adds that "The authority to approve resettlement such operations within U.S. territories," would require a "special exception" to The Posse Comitatus Act, which can be obtained via "the President invoking his executive authority." The document also makes reference to identifying detainees using their "social security number." Aside from enemy combatants and other classifications of detainees, the manual includes the designation of "civilian internees," in other words citizens who are detained for, "security reasons, for protection, or because he or she committed an offense against the detaining power." Once the detainees have been processed into the internment camp, the manual explains how they will be "indoctrinated," with a particular focus on targeting political dissidents, into expressing support for U.S. policies. Is this still America, home of the brave and land of the free? Certainly not much longer. Is the U.S government capable of detaining law abiding U.S. citizens to quell dissent. Certainly! One only has to look at the history of detaining Japanese U.S. citizens during World War II. Why would the U.S. government stage a false flag attack? To protect the corrupted political process and keep it in power by demonizing a group which threatens its existence. That group today are primarily armed forces returning veterans. The Obama administration has labeled them as "potential terrorists" out of fear. To see why please view the video below known as The Battle of Athens which is based on historical fact. "A well regulated militia being necessary to the security of a free state, the right of the people to keep and bear arms, shall not be infringed. "..The Second Amendment to the United States Constitution. What does the "Hope and Change" mantra of Obama and his leftist Progressives really mean? My answer to the Progressive's "Hope and Change" is a little more honesty about how they want to destroy this county, less corruption of the political process, and few of Ron Paul's ideas for good measure. This Lenco BearCat armored vehicle has option controls for battering rams, winches and even surviving a chemical weapons attack. With military-grade armor and the ability to take repeated hits from bullets up to .50 caliber, it's most frequently used by police. What is the U.S. government so afraid of that it is spending billions on vehicles like these to patrol the streets of America? I'll tell you what. Very simple: 1.150 million gunowners, 2.270 to 300 million privately owned firearms, 3 trillion rounds of ammunition. In other words they are afraid of constitutionaly minded Americans who will defend their 2nd amendment right to own firearms which will be used to defend themselves against a tyrannical American government. 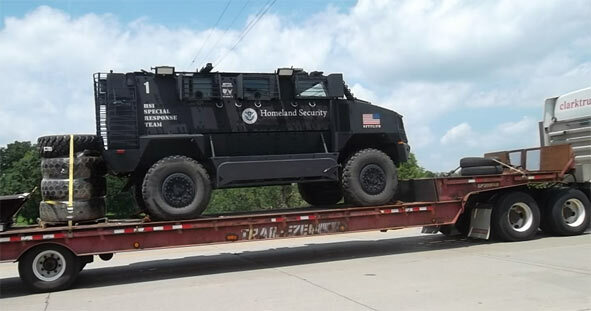 As the media demonizes gun owners, patriots, and U.S. citizens willing to defend their constitutional rights, the U.S government through the Department of Homeland Security is preparing for war with the American people.